For the production of tray baked products like soft buns, rolls, cakes, baguettes etcetera, the most well-known industrial production solution widely applied in the bakery industry is based on a linear conveying system, mostly built around a tunnel oven. Unfortunately such a linear solution does not always fit the customers need with the consequence to refrain from access to production automation that they are looking for. Through ‘out of the box’ thinking we have developed a smart bakery solution that is more flexible and less space consuming. We call this smart bakery solution The ‘BOX System’ and have already successfully implemented this system in many Dutch industrial bakeries. With this system higher efficiency, better flexibility, traceability and cost reduction can be achieved. The BOX System offers new dynamics to production automation in the bakery industry and is opening new opportunities against the less flexible and more space consuming linear systems. 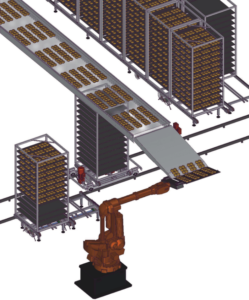 In this system, baking trays are placed in so-called transport boxes by a robot (mechanical loading devices are also applicable). Once being loaded with trays carrying the raw dough, the boxes will be conveyed through the process of proofing, baking, cooling and, if applicable, freezing before arriving in the packaging department for unloading. Because the final products have a fixed position on the tray during the whole process, it offers further automation options in the packaging department like direct Pick & Place into the packaging machine. Unlike the linear system, the BOX System works in a batch based manner which allows a much higher production flexibility during operation, a need that is tremendously increasing in the global bakery industry. Differentiation of processing times (proof, bake and cool) can easily be achieved without creating too much downtime of the line and also total process change from fresh baking into e.g. par-baked frozen can be accommodated quit simple. The system is totally programmable and also can act as an accumulator in the cooling section so that a problem downstream can be resolved without losing valuable products (= output) or production time (= capacity). Based on these features the BOX System is recognized to be the most flexible and cost effective system for production of tray baked products offering the owner total Cost leadership at a very high product quality level. A smart solution isn’t it?